Greg Niemann is a life-long Baja buff with a home in Cantamar, Baja California, Mexico. He has traveled and camped all over the Baja peninsula for over 50 years. ". . . the telling of experiences and lessons learned by a man, and his family and friends, during their many travels and stays in Baja California, México. BAJA FEVER - not a guidebook - is a delightful inlet into the lives and souls of Baja Californios, and the beautiful peninsula. Greg Niemann is of a third generation of a family inflicted with the contagious but benevolent fever. He tells of his experiences in a unique writing style, in a manner guaranteed to move the readers." A truly terrific book on Baja. Greg Niemann captures the incredible drawing power of Baja, through his personal experiences of years of travel throughout the peninsula. I really enjoyed the detailed descriptions of the places Greg has visited. I love this book! I couldn't put this book down! Greg Niemann's detailed explanations of the things he's seen in his many years of Baja travel make this a gem of a book to own! 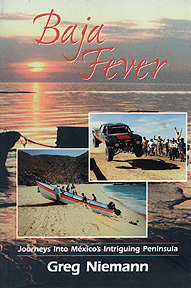 Having caught "Baja Fever" a few years back, all this book did was raise my temperature to new heights! Baja Fever is one illness I really want to keep! -- Reviewer, Los Angeles.